A legend of a lone dinosaur inspires Littlefoot and his friends. They learn about the saurus rock, which is very important to the inhabitants of the great valley. After an accident leaves part of the statue broken, strange disasters begin to occur. A newcomer named Doc that resembles the fabled Lone Dinosaur is blamed for these ill events, but the gang blames themselves for what has happened. Now it is up to Littlefoot and his friends to figure out a way to solve the problem. Will they succeed? 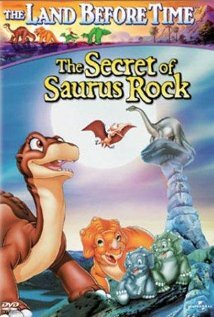 You will have to watch The Land Before Time VI: The Secret of Saurus Rock to find out for yourself. To learn more about the film, you should go to http://www.imdb.com/title/tt0167247/?ref_=fn_al_tt_1 This Movie gets a Five out of Five Popcorns rating.